Whether it’s solo harp or Harp with Flute, Violin and Cello, This talented group of Chamber musicians can add style, class and charm to any Wedding or corporate function. Leader Roseanne Canfora has prepared an extensive repertoire of Classical, Religious and popular music pieces to complement and enhance any event. Roseann's Celestial Strings Duo, Trio, and Quartet have performed in weddings and receptions at the Cleveland Botanical Gardens, Stan Hywett Hall, the Cleveland Metroparks Rain Forest, Windows-on-the-River, Walden Country Inn, The Hillbrook Club, the Fellows Riverside Gardens, The Country Clubs of Hudson, Aurora, Shaker Heights, Barrington, Portage, Twin Lakes, and Chagrin Valley, at Mario's Cabin, the Glidden House, the Ritz Carlton, Pine Lake Trout Club, the Shoreby Club, and more. 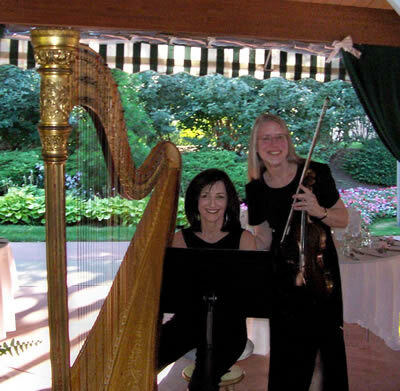 Roseann has served dining guests as resident Harpist for Waters Restaurant in Hudson, voted #1 by Cleveland Magazine & Plain Dealer.Com (2004), and more recently at the Bertram Inn & Conference Center in Aurora, and the Twin Lakes Country Club in Kent, Ohio. To learn more about this string duo, contact Conn Entertainment at 216.849.3545.